Tracking the musical journey of Bill Prince could keep a family of mapmakers busy for years. This master musician has traveled and performed in all 50 U.S. states and in 81 countries. He has walked the historic streets of Europe, the dirt pathways of South African villages, and sailed the oceans, performing his unique multi-instrumentalist show on multiple cruise ships. I was privileged to work with Bill to write his biography, MUSIC IS MY TICKET: THE MUSICAL JOURNEY OF BILL PRINCE. The book touches on historic events like the Cuban Missile Crisis while providing insights into the music and musicians he played with—the famous and not-so-famous personalities he met during a remarkable career. Bill formed strong bonds with many musicians, former students, and fellow teachers over the years, and you’ll hear from some of them. Their shared memories and insights into a life rooted in music, describing Bill Prince as a once-in-a-generation talent. 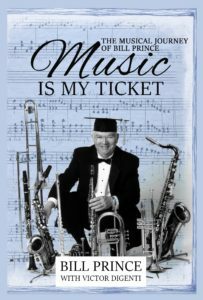 MUSIC IS MY TICKET is now available for purchase on Amazon. No need to pack your bags to accompany Bill Prince on his musical journey, but hang on tight and enjoy the life story of a joyful traveler who made his mark on the world of music.